Brentford's new boss Terry Butcher has made his third signing since taking charge by picking up Hibernian keeper Simon Brown on a free transfer. 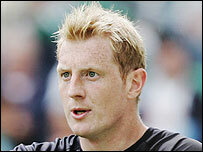 Brown, who was at Easter Road for three years after moving from Colchester, has signed a two-year contract. "The main attraction of joining was Terry's desire to move the club in the right direction," Brown said. Meanwhile defender Darius Charles has signed a new two-year contract but Alex Rhodes has turned down a new deal.